Water pumps, what are they good for? Well, quite a lot actually and they can be utilised to help you with many gardening tasks. The most obvious use is for any garden water features you might have. Your water fountain isn’t going to look very good without a water pump keeping the water flowing through it. If you have a garden pond, using a water pump with it is a very good idea. The right kind of pump will not only filter the water keeping it oxygenised, but also keep the water circulating and stop it from becoming stagnant. This will prevent mosquitos laying their eggs in your pond and also stop algae building up. A water pump is also a good investment if you are lucky enough to have a swimming pool or, on the other hand, you are unfortunate enough to live in an area that is a flood risk. A water pump can be a god send if you get a burst pipe and flood a part of your house. Do you have low water pressure from your outside tap? This can be a pain in the neck when trying to use spray hoses and such. The installation of a water pump can improve your water pressure output and can keep your automatic watering systems fed with a good supply of water. There are two main types of garden water pump, submersible and non-submersible, easy enough to remember right? The submersible water pumps are completely water proof and are placed under the water (submerged) and out of sight. Non-submerged water pumps sit at the side of the water supply and can’t be submerged. Care must be taken when setting these pumps up as they must have water in the pipes or it will start taking in air instead. Garden water pumps come in a host of different sizes and it’s important to get the right size for your pond or water feature in order for the pump to work to the best of its ability. There are also different ways these pumps get there power. It could be mains electric, battery, petrol or solar power. Below I’ve added some reviews of the best water pumps available in the UK at the moment. So, time to move on to the water pump reviews. The first reviews are for electric submersible water pumps. Let’s begin shall we? My first choice for a budget submersible water pump comes to us courtesy of manufacturers Hardcastle for 26.99. It is powered by a 400 watt electric motor and has a maximum pump rate of 7500 litres per hour. It been made for home use, such as garden ponds and swimming pools and will work in water up to 5 metres deep. The Hardcastle electric submersible water pump has been made with a corrosion proof plastic body and is GS/TUV approved. This means that it has been tested in a third party laboratory based in Germany and has been subject to tests on its durability amongst other tests. This water pump has been designed for a variety of uses, such as pumping clean or dirty water and can handle particles up to 35mm. It can also be used for draining containers or larger things such as boats and swimming pools ,but this may take a while, and also for transferring liquids. Included in the box are 2 hose outlet adapters- a 1 inch adapter and a 1.25 inch adapter. There is also an automatic float switch that gives you the choice of operating it manually or automatically. There isn’t a connector to fit a common garden hose though and I thought that was definitely a negative as a lot of people will be planning on using one with this water pump. The recommended depth is at least 15cm but I found that by making sure the float switch stayed in a vertical position, this product kept on pumping until the water was lower in depth than that before it stopped working. This I was pleased with, as the rest of the water was easy to shift by hand. Another thing I liked is that this water pump is very quiet, so I could use it early in the morning if need be without waking up the whole family. 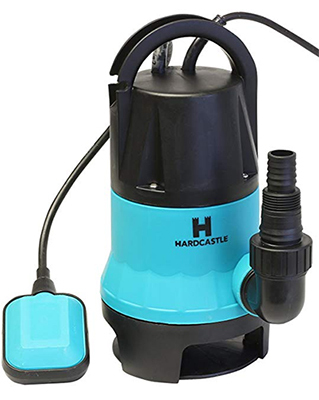 A quiet operating, cheap yet quality tested product, the Hardcastle submersible water pump is perfect for those on a tight budget or who for people who don’t need excessive pumping power. I chose the Terratek stainless steel water pump as my best overall submersible pump because priced at 65.99, it offers the best value for money. The terratek has a powerful 1100 watt motor powering it and that allows it to pump 250 litres per minute. That’s a fairly impressive rate and should satisfy most customers. This electric submersible pump is constructed of durable and, equally important, corrosion proof stainless steel. Terratek are confident in the robustness of their product and it comes with a 2 year guarantee. Like our previous review, this garden water pump will remove dirt particles from water up to 35mm in size. However, this electric water pump will do so much quicker than the Hardcastle submersible pump we just reviewed, and works great as an outdoor water feature pump, for emptying swimming pools and just about everything else. This model is also fitted with a float switch so it’ll automatically turn off when it reaches a certain depth and won’t continue to run dry and cause damage to itself. This electric submersible water pump can handle depths of up to 7 metres and can used with a lay flat hose. The box includes the water pump, 1 step adapter and 1 hose elbow. The one thing I didn’t like was that the float switch is held on by a clip that is not made of the same standard materials as the rest of the water pump and seems like it will break easily. 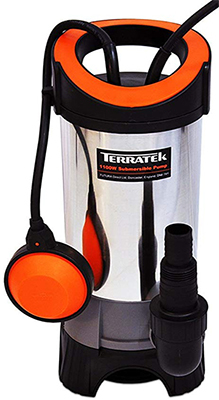 The Terratek submersible water pump is a high quality, low cost pump that gives good performance for the price. 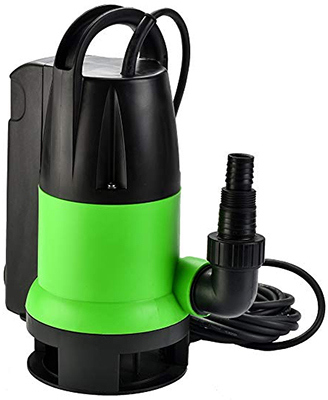 Another electric submersible water pump that offers good value for money is..
Fluentec’s electric 750W submersible water pump can be purchased on Amazon for 44.99 with free UK delivery. It gets its power from a 750 watt electric motor that operates at 230 volts. This motor creates a respectable water flow of 12500 litres per hour and can lift water to a maximum height of 8 metres. It can be used down in depths of 7 metres and in dirty water with 35mm solids. Like our other submersible water pump reviews, this model can be left unattended as it has the same float switch feature top turn itself off automatically and prevent it running dry. The float switch on this model is set lower than the Terratek and will continue to pump all the way down to 7cm in depth. If you want to squeeze another 2cm out of it, you can switch it to manual mode and it will work in 5cm of water. An extra feature of this particular water pump is its protection from overheating. The built in thermal protector will shut the pump down when it gets too hot and switch itself back on once it has cooled down. This electric water pump is quite compact and lightweight. Weighing in at just under 6 kilograms, it won’t be struggle for anyone to move it around. The reason the Fluentec submersible water pump is lightweight is because it is constructed of plastic. The plastic feels durable enough, but some customers may be put off by this and seek a metallic pump instead. The base of the pump is flat, so this means it can be ‘pit installed’ which can come in handy in flood risk areas. The pump comes with a 10 metre hose, various sized hose adapters and an instruction manual. An electric water pump with some nice features such as the thermal protection. Well worth the low price tag. These days we all have to do our bit for the environment and saving power is something we should all strive to do. Using a solar powered water pump is probably the most environmentally friendly option available and here I have reviewed a couple for your reading pleasure. Please bear in mind, solar pumps are not as powerful as submersible electric pumps and can’t be used for the same applications. Solar pumps are mainly used for oxygenation of ponds and as garden feature pumps like a water fountain or bird bath. 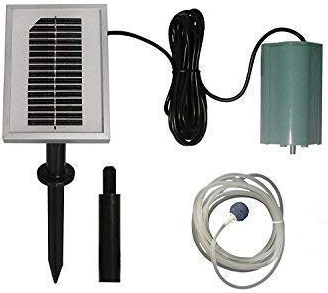 On sale for only 25.99, this solar water pump is a great budget choice to keep your garden pond in a healthy state. Makerws, Garden Mile say this solar pump is suitable for ponds up to 1450 litres and pumps an air volume of 120 litres per hour so your fish can lead happy longer lives. In reality, I think this pump would work best for smaller ponds, but it is still a good solar water pump for the low price. The 6V pump is powered by the 0.7 watt solar panel so there are no running costs and no need for any external power source, cables or wiring. The simple design of this solar water pump means it is child’s play to set up and you can have it up and running in no time at all. In the middle of the day under clear skies, this product pumps out an impressive stream of bubbles. Under cloudy skies, it still produces bubbles but less so. Then again, it’s under sunny weather when ponds need the most oxygenising anyway, so it isn’t a huge flaw. The biggest flaws this solar water pump has is firstly, it’s not waterproof so you can’t leave it out in heavy rain. Second of all this pump won’t work optimally if laid on the ground as the air in inducted through the bottom, so it needs to be placed on something like a flower pot that allows for air flow to get the best results. Still works in cloudy weather. A small water pump for small ponds. It is child’s play to set up and get running and has no running costs. If you have a small to medium sized water feature, this solar water fountain pump from Tidal, priced at 79 pounds could be the right choice for you. 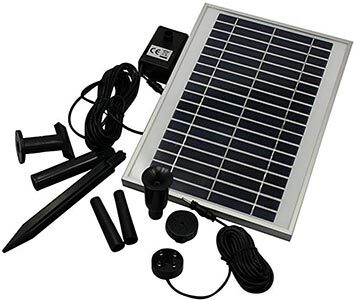 The solar panel 5 watts and operates at 9 volts. This gives the pump enough power to lift water 1.4 metres at 400 litres per hour and should be enough for most medium sized water fountains. The best feature this solar water fountain pump is that it has battery backup. Included in the box is a lithium 7.4V battery that is charged during the day while the pump is in operation. When the sun goes down, the light sensor will automatically switch the water pump onto battery powered mode. On top of this, a set of LED lights will light up, letting you know that it has changed modes and also acting as illumination for your water fountain at night. The cable from the solar panel to the pump is 5 metres so you can find a bright spot in your garden to place it and also move it around to catch the rays if need be. This water pump comes with a ground spike to keep your solar panel in place. There is also a handy on/off switch for the water pump situated on the back of the solar panel. It’s good to have the option to switch of the pump to charge the battery quicker. I was disappointed that there isn’t an optional electrical charger for the battery, as this would have come in very handy in winter and very cloudy days, of which we have many here in the UK. Solar powered and self-charging for nighttime operation, this solar water pump has some very good ideas and is only let down by not having the option to charge it from the mains. If you have a large garden pond, want to drain a large container or flooded area in a hurry or have a large irrigation system to supply, a petrol water pump will give you the power you need. Here are my top petrol water pump reviews. Eberth have given us a cheap petrol water pump that performs as well, if not better, than a lot of models that cost more than the 109.90 asking price for this one. The petrol powered, 2 stroke, 2 HP motor is powerful, robust, sturdy and well designed. Capable of pumping 12,500 litres per hour (200 litres per minute), this petrol water pump can comfortably drain a decent sized swimming pool, feed a large multi-location sprinkler system or keep a large water feature going. The Eberth petrol water pump has a maximum pump height of 17.5 metres and a maximum suction lift of 7 metres. That’s good performance for a low priced pump that only weighs 7kg. This lightweight design, coupled with there being no need for a power cable, allows this petrol water pump to be much more mobile than the electric variety. As for faults, well it is a 2 stroke engine so it’s not the quietest machine in the world and ear plugs should be worn. Also, like all petrol powered machines, it gives off emissions so you have to be aware of this if thinking about using it in confined spaces. A well performing, lightweight petrol water pump priced at just over a hundred pounds, what’s not to like? The Briggs & Stratton Elite petrol water pump is on sale for 209.40 on Amazon and in my opinion, is worth every penny. Briggs &Stratton are well known for their motor’s build quality and performance. 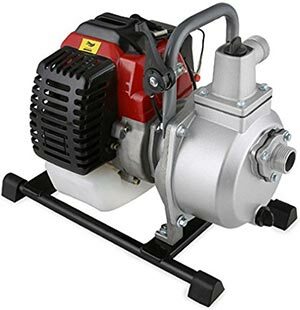 This particular model of petrol water pump is fitted with their 550 series, 127cc OHV engine that has a cast iron sleeve, giving it great durability. The motor powering this water pump has also been designed to be quiet and the engine has a lo-tone muffler to keep the decibels down. The iron sleeve of the motor also helps with noise reduction. This petrol water pump also has an anti-vibration system and rubber feet to reduce the shaking of the machine and a very handy feature where the machine will automatically switch itself off if it detects that it is low on oil, thus preventing any needless damage and adding to this product’s excellent longevity. 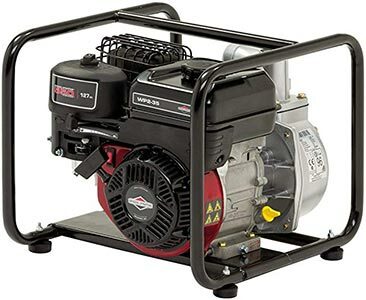 Performance wise, you can’t fault the Briggs & Stratton Elite Petrol water pump. It has a high maximum water flow rate of 450 litres per minute (27,000 litres per hour), 8 metres of vertical suction, and 33 metres maximum head lift, outperforming our last review in every way. The products dimensions are 47 x 41 x 39 cm so it’s not too bulky but it weighs 23 kg which might be a little heavy for some people to carry around. The weight is a byproduct of this petrol water pump’s excellent build quality. The motor is protected by full steel frame, and double ball bearings added with aluminium hose fittings ensure that this water pump will last. The only drawback I can say about this machine is that it takes a little setting up, finding and attaching the 2 inch hoses to the intake and output. All-in-all, this is an excellent, high performance water pump. The Brigg & Stratton Elite really lives up to its name, giving a great combination of robustness and durability, great pumping performance, and some nice features such as noise and vibration reduction, and switching itself off when the oil levels get too low.